Chocolate & coffee join forces with nutrient rich, power giving nuts & seeds in these moist & decadent Mocha Hazelnut Power Balls. A healthy, energy boosting snack has never tasted so good! Toast the hazelnuts in a fry pan over a medium heat for a few minutes. Remove from the heat and allow to cool. Pour the hazelnuts into a bag, secure the end and bash them up with a rolling pin or the bottom of a saucepan. You want lots of different sized chunks. Pour in the brown rice syrup and coffee/cocoa mixture and mix very well. Add the maple syrup as per the recipes notes. Stir everything together extremely well. It will be hard work but doesn't take long. The mixture will be quite sticky. Now it is time to shape the mixture into balls. You can make them as big or small as you like. I made mine walnut sized. If you find it is too sticky to handle you can put the bowl in the fridge for a while and it will firm up a bit. Once in a ball shape roll in the reserved coconut and place on a plate or on a tray. Keep them in a single layer so they don't squash. Continue forming balls until your mixture is gone then cover with cling wrap or put in a lidded container. If you can manage to leave them alone in the fridge for 24 hours they will firm up nicely. They will keep in the fridge for a few weeks. Add the maple syrup gradually and as you mix it in taste the mixture. 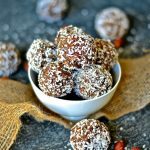 I have a sweet tooth and liked my power balls with the full 1/4 cup but you might prefer them with a bit less, Stop when the mixture tastes sweet enough.